Swinford were given a lesson in fast flowing football by the home team in Westport today. Westport took the game to Swinford from the first minute and Swinford’s young outfit had no answer to the home teams precision play. Westport had racked up 3-8 by the half time whistle and only for a spirited second half performance by the men in black and red the full time score could have been a lot worse. Goals by Vin Roughneen and Sean Geraghty helped to put a respectable look on the scoreline. 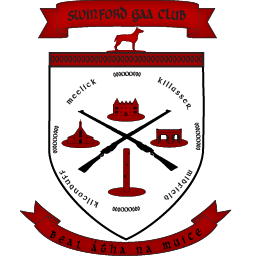 This was a salutory lesson for Swinford today but they will hope to bounce back against near neighbours Kiltimagh next weekend who themselves had a two point loss to Eastern Gaels today. Team: Robert Hunter, John G Kelly, Fintan Kenny, Fergal Harte, Mark McNicholas, Sean Kavanagh, Philip Ryan, Tom Horkan, Danny McNicholas, Sean Geraghty, Adrian Forkan, Gerry Callaghan, Tom Kavanagh, Kevin McShea, Darren Campbell. Subs, Kevin Barry for Ryan, Vin Roughneen for McShea, Fergal Loftus for Callaghan, Damien Geraghty for Hunter.